« The ‘curse’ of winning the lottery? Published in the journal Biological Conservation, it reviews 73 existing studies from around the world published over the past13 years. 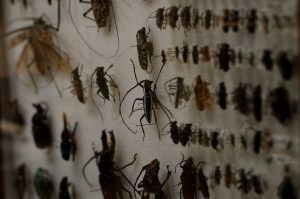 The researchers found that declines in almost all regions may lead to the extinction of 40% of insects over the next few decades. One-third of insect species are classed as Endangered. “The main factor is the loss of habitat, due to agricultural practices, urbanisation and deforestation,” lead author Dr Francisco Sánchez-Bayo, from the University of Sydney, told BBC News. “Fast-breeding pest insects will probably thrive because of the warmer conditions, because many of their natural enemies, which breed more slowly, will disappear, ” said Prof Dave Goulson from the University of Sussex who was not involved in the review. As regular readers of this Church of God News page are aware, I have covered the decline and potential impact of the loss of bees for many years (e.g. ‘Bee Apocalypse Now’). While the above will likely include human-engineered pests, natural pests are also expected to be an issue. So, the opening of the fourth seal is the time that the pale horse of death is apparently increasing death by war, hunger, and pestilences (the beasts of the earth). a quotation from a former Harvard Professor who gave this report to ‘The Plain Truth’. He is now President of the Physicians for Social Responsibility; and this is the quote. Notice that the idea that certain insects would grow exponentially has been a concern from some time. Insects are also a threat as various ones, like mosquitoes, carry various diseases. When, if God doesn’t step in and supernaturally and intervene — which He will — that no flesh could be saved alive. That humanity would be blasted off of this continent. And, yes, the old WCG was right that repentance in needed. And yes, the solution will be God’s intervention, and the establishment of the coming Kingdom of God. However, before then, more pestilences are coming (Revelation 6:7-8). If so, properly respond to that calling. Chimeras: Has Science Crossed the Line? What are chimeras? Has science crossed the line? Does the Bible give any clues? A video of related interest is Half human, half pig: What’s the difference? This entry was posted on Monday, February 11th, 2019 at 8:00 am	and is filed under Prophecy, WCG News. BibleNewsProphecy: Amphibian Apocalypse: Threat to Humans?